Newsweek Retracts Franken Story; When Will AP Fix False Nikolas Cruz-White Nationalism Items? Nina Burleigh really blew it this time. On Wednesday morning, Newsweek retracted their reporter's Monday story on "How an Alt-Right Bot Network Took Down Al Franken." 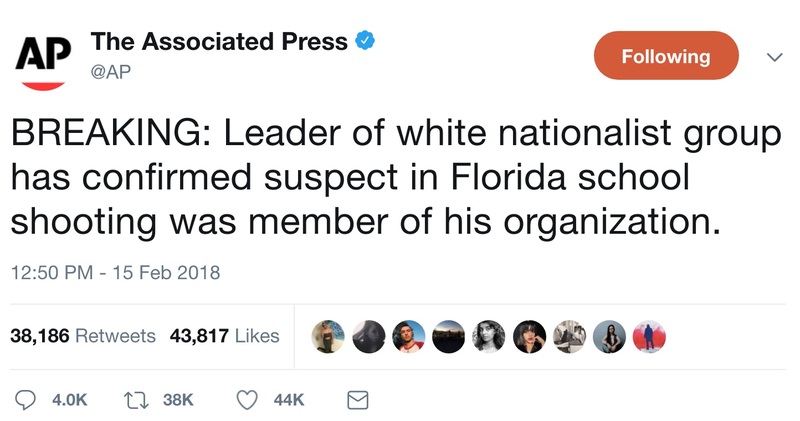 Newsweek's move leads to a bigger question: When will the Associated Press correct or retract reports claiming Florida high school massacre perpetrator Nikolas Cruz was connected with white nationalism? The Internet Archive has Burleigh's original report and a revised follow-up containing an "Editor's Note." On December 7, just before Democrats started calling for Franken to step down ... freshly minted Japan-based fake sites went to work ... (and) mobilized against Franken ... urging women and activists to stand down on support for Franken. One big problem: Over 30 Senate Democrats called for Franken's resignation on December 6. "Mobilized" websites and bots were irrelevant. Newsweek has retracted its story about a conservative botnet effort to force the resignation of Senator Al Franken. The initial report was based on research conducted by Unhack The Vote, a group examining outside influence in U.S. elections and politics. It alleged that a "decidedly alt-right" botnet "weaponized" anti-Franken stories and amplified pressure on Franken to resign after allegations of sexual misconduct. Newsweek was unable to independently verify their claims after a further review of their work. Powerline's John Hinderaker described Unhack the Vote Monday as "a scurrilous left-wing outfit ... criticized by the Daily Kos(!) as an unreliable purveyor of fake 'evidence.'" You're really out there when you've lost Daily Kos. Newsweek and Burleigh also appear to have heavily relied on a now-removed (but still archived) Medium.com item accusing "The Alt-Right Propaganda Machine" of a "pizzagate-style propaganda hit job" against Franken. The fact remains, as I noted Tuesday, that "Al Franken's own actions, and his reactions once exposed, ended his Senate career." As I noted on February 16, concerning that group's leader, "As AP's sole source, Jordan Jereb didn't 'confirm' anything." After publishing a timeline item and at least two stories containing unquestioned assertions of Cruz's white nationalism, several outlets declared that AP and others were "fooled" into believing Jereb by internet trolls. The AP still only concedes that Jereb "appears to have lied." Nevertheless, as detailed at my home blog Wednesday evening, dozens of earlier AP reports containing Jereb's undisputed claim remain at its own and subscribing outlets' websites. Other dispatches issued before AP's partial concession contained both Jereb's claim and de facto law-enforcement denials. As of Wednesday evening, AP's formal list of corrections included none of this botched reporting. How bad is the situation in modern journalism when one must ask when the AP will raise its standards to the level of Newsweek, remove its bogus tweet, and formally correct or retract its false stories?